* Note: Speakers are generally covered, however there are occasions that we do not cover them depending on the complexity of the speaker and/or if the speaker may be raised or not. Your dashboard can be a little boring and can get damaged by UV rays and heat. Add a refined look to your vehicle with our custom-fit SuedeMats. These dash covers are made to fit your exact dash while adding a luxurious look and feel. 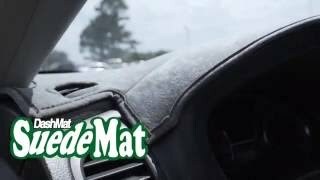 These dashmats don't just look, feel, and fit amazingly though. They offer protection for your dash which prevents them from cracking, fading and deteriorating from the intense UV rays and concentrated heat buildup. The dash covers will also help keep your vehicle cooler in the summer months and warmer in the winter months. Add some personalization with custom embroidery, logo, and even officially licensed Ford logos.